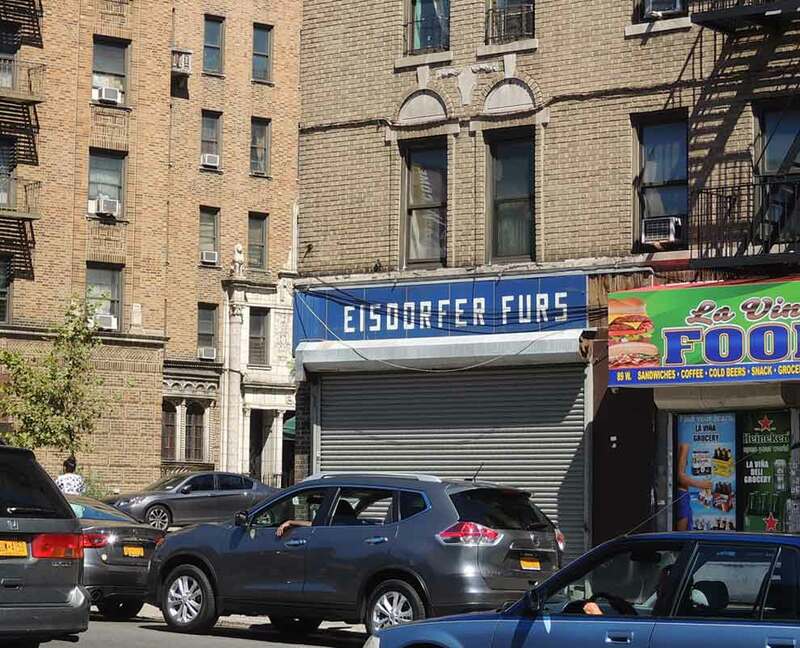 Eisdorfer Furs was located here on West Kingsbridge Road, the Bronx, on the corner of University Avenue from 1954 to 1985. Proprietor was David Eisdorfer (1896-1985), an immigrant from Hungary approximately 1913. He registered for the World War I draft in 1917 when he lived on East 7th St., Manhattan. At that time he was working as a tailor and said that he was born Kishwal, Hungary, 27 January 1896. What is written as Kishwal might very well be Kisvárda, a town in present day northeast Hungary near the border of Slovakia and Ukraine. Dave Eisdorfer's father, Moritz Eisdorfer, immigrating in 1913, stated on the ship's manifest of the SS Saxonia sailing from Fiume (Croatia) that his last permanent residence was Kisvárda. In the 1920 U. S. Census David Eisdorfer lived on East 7th St. in the home of his father and mother and three siblings. He was not a citizen and worked on cloaks in a tailor shop. He became a naturalized U. S. citizen 6 December 1922 in the New York County Supreme Court. By 1930 Dave Eisdorfer had his own family and lived at 2735 Sedgwick Avenue, the Bronx. His occupation was furrier. In 1940 this information was substantially the same. And then when he registered for the World War II draft in 1942, he stated that he was 46 years old, born 27 January 1896, and that he had his own business at his home address, 2735 Sedgwick Avenue, the Bronx. The Bronx telephone directory first listed Dave Eisdorfer, furrier, in 1947, when his store was located at 145 West Kingsbridge Road. This address changed in 1954 to 91 West Kingsbridge Road, where he continued to be listed through 1985. Find-A-Grave.com records Dave Eisdorfer died 19 April 1985, buried Mount Moriah Cemetery, Fairview, Bergen County, New Jersey.